There are two sides to this tabletop easel. 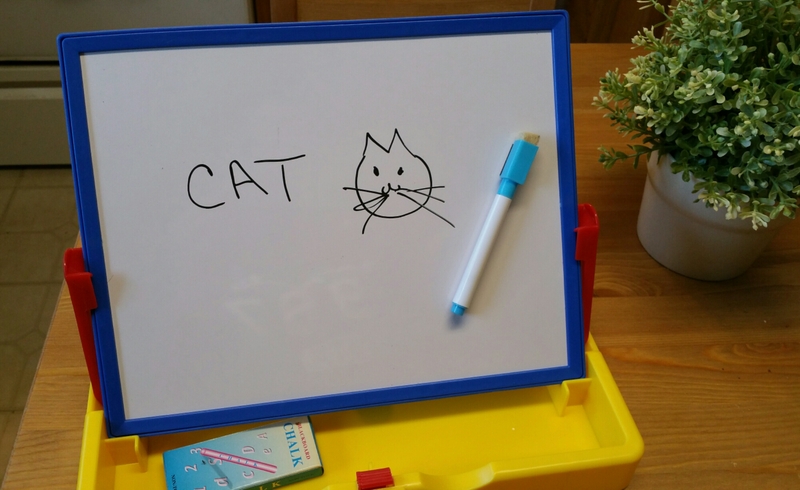 A chalkboard side, and a dry erase side; both are magnetic. This particular set is the company’s flower version. 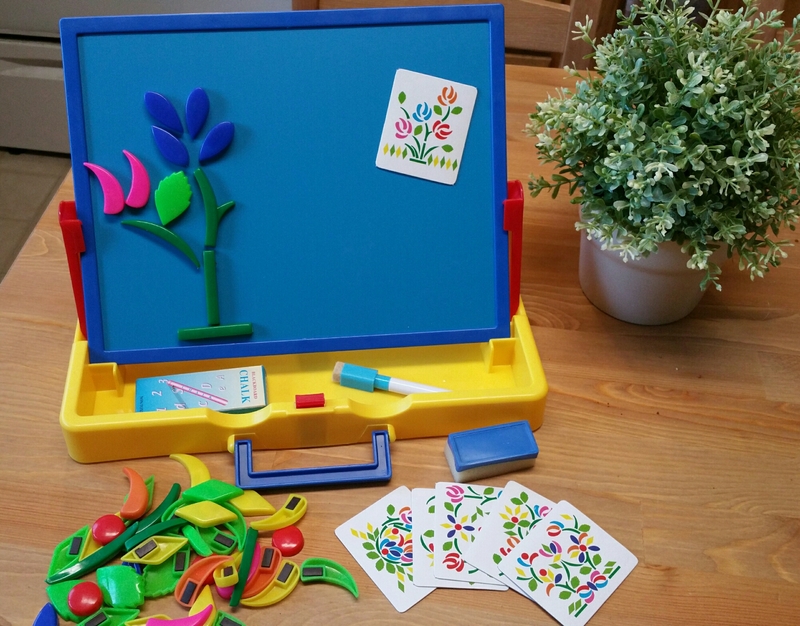 Little flower pieces are included, along with 6 templates, to create various flowers on the board. My daughter chose to chuck the templates and create her own *ahem* interesting masterpieces! Also included are chalk pieces, a dry erase marker, a little eraser, and magnetic strips to place onto the templates. I found this little easel adorable. All of the materials pack neatly inside, and are held nicely in place. 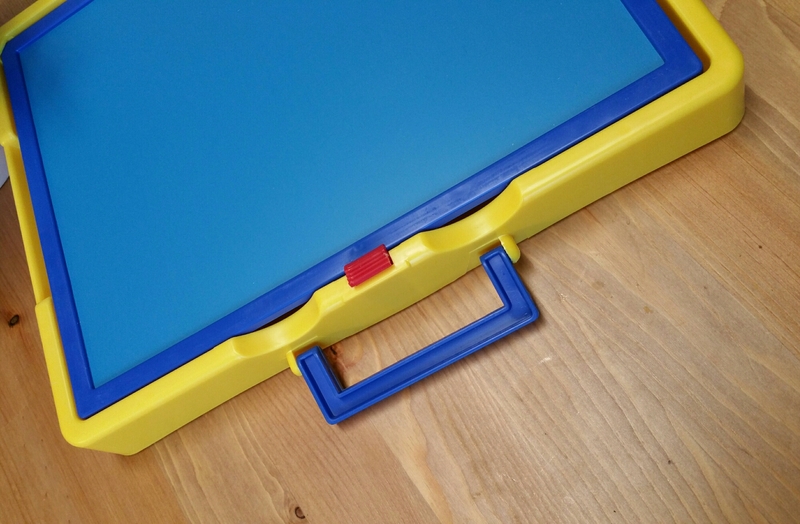 It’s easy to open and set up, and can be used either as an easel, or even laid flat. Both boards wiped clean without any weird residues. We’ve been using this board not just to recreate flower shapes, but for so much more! 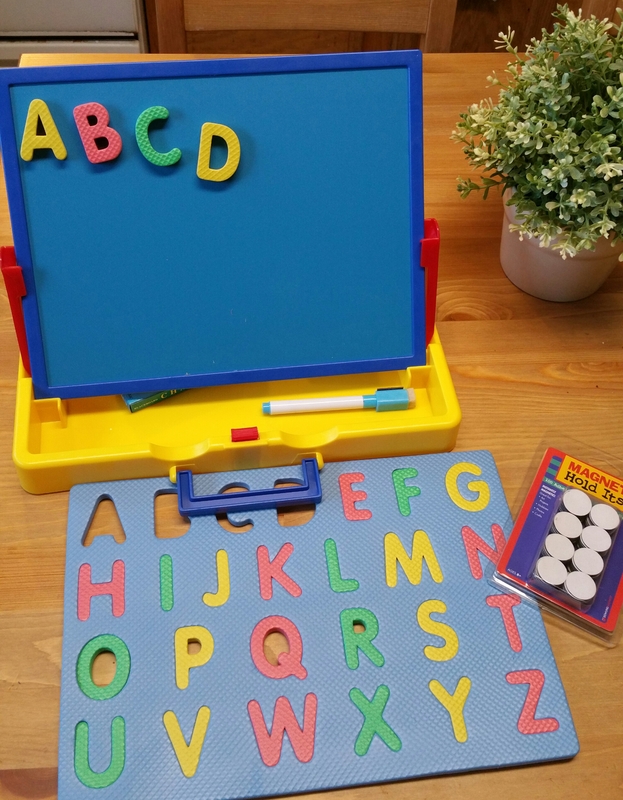 I used $1 foam letters (not included with this set) and placed magnet tape onto the backs, and my daughter can now practice alphabets on the board. I’ve also used the dry erase side to help with her tracing practice. She’s been enjoying the new learning angle, and it’s keeping her interested longer. I have noticed that on my wooden table, the base slides around a bit when writing on it in easel position. Because it doesn’t have any grip on the bottom, you’ll find yourself pulling it back closer to you quite a bit. Minute annoyance but worth noting. Overall, this has been a great addition to our homeschooling materials. It’s colorful, easy to use and store, and adds a new element to our lessons. To check it out and purchase on Amazon, head to Wishtime’s product page HERE! *Disclosure: I received this product complementary from the company for testing and review purposes. All opinions are my own. Cool! Can’t wait to try it out myself.